Outlook Contacts to Lotus Notes is an effective tool to export MS Outlook contacts to Lotus Notes (names.nsf) file. Software supports to convert & export contacts of MS Outlook 2000/2002/XP/2003/2007. Outlook Contacts to Lotus Notes tool lets users to export MS Outlook contacts to Lotus Notes Address Book. 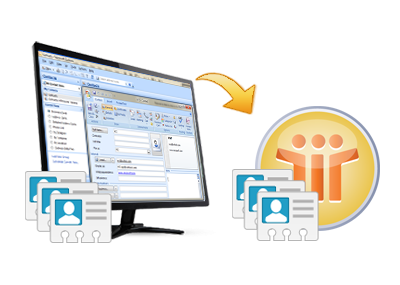 Software quickly converts MS Outlook contacts (.pst file) to Lotus Notes. For more help regarding software steps and features refer to our Software Guide to Convert Outlook Contacts to Lotus Notes. In a running instance, software allows adding only one PST file for processing. However, single PST file can have multiple folders, fields, and number of contacts that gets exported into Notes ® names.nsf file. If addresses from PST file of configured Outlook profile has to be migrated, this can be done with the tool. Also, if the PST is brought from some external source to the system, it can be added to tool for conversion. On adding PST file to the tool, software gives a view of folders in the contact list. You can enable check box for folders to include them in conversion and uncheck them to exclude them from export process. When contacts from PST file has to be saved in names.nsf file, the software puts forward question to the users is the contacts have to be saved in existing names.nsf file or into a newly created names.nsf file. The tool ensures that no change in the contact fields is done when PST to NSF contacts migration takes place. All crucial fields of PST contacts (name, second name, business address, fax etc.) will remain absolutely intact. The tool gives status report of contacts that is being currently processed by the tool and shows how many contacts out of total number have been converted by the tool. Is this tool holds all Contacts Information while Migration? Yes, this software convert Outlook Contacts to Lotus Notes format completely. Is this tool convert multiple PST file to Lotus Notes at the same time ? No, you can convert one PST having multiple contacts in it. After completing one PST user can convert another Outlook one by one. Does this software install on MAC machine? No, Outlook Contacts to Lotus Notes Software is Window Based utility and it can only run on Windows Operating System. Should Lotus Notes and Outlook be available on machine to perform Conversion? Yes, Software requires both Lotus Notes and Outlook environment on machine to start the conversion process.